Like many others, I was excited to see that Facebook is putting on a conference for the React community. Tickets were being released in three waves, and so for the last three Fridays I have been trying to get one. The first Friday I did not even manage to see an order form. The next week I got as far as choosing a quantity, before being told that tickets were sold out when pushing the “Submit” button. I looked at the form fields that had loaded, and they had complex names like order[TicketOrder][email]. It seemed like it would be difficult to guess the names of the missing ones (I checked the network request and they were not being submitted at all). I then had the idea of finding another Splash event order form, and seeing if I could get the valid form fields from there. I eventually ended up on the ticket page for a music video release party that had a working credit card form. 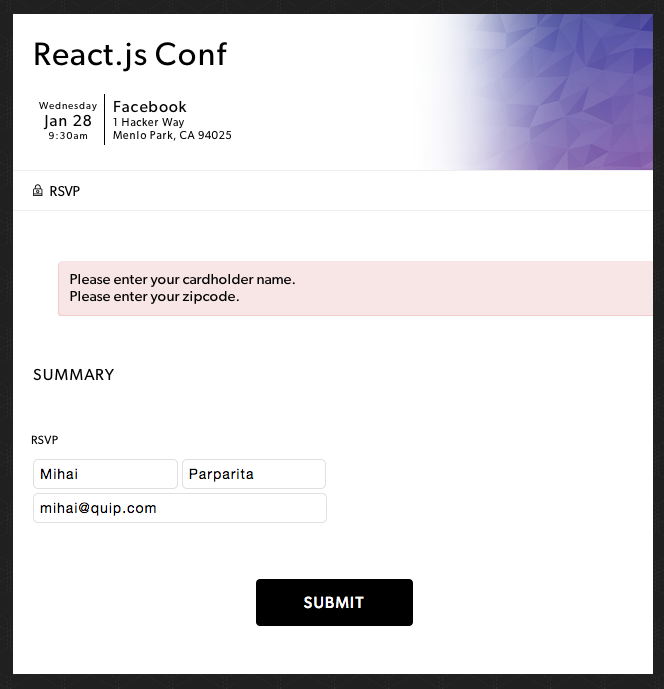 Excited, I copied the form fields into the React order page that I still had up, filled them out, and pressed “Submit”. There was a small bump where it thought that the expiration date field was required and not provided, but I bypassed that client-side check and got a promising-looking spinner that indicated that the order was being processed. Possibly not quite as epic was my last attempt at working around broken service providers, but it still made for an exciting excuse to be late for lunch. And if anyone wants to go a music video release party tonight in Brooklyn, I have a ticket². I now see that other Splash order forms have the same network error, so it may have been a red herring. Amusingly enough, I appeared to have bought the last pre-sale ticket there — they are sold out too.